After visiting the Taj Mahal and various Mughal palaces Ive been able to gain the sense of the wealth and power that this dynasty had in the 16th and 17th centuries. At one time this dynasty controlled about 24% of the worlds trade which resulted in many different acts of recreational activities. One such activity was the sport of tiger hunting. This sport was first taken up by emperor Jalal-ud-Din Muhammad Akbar, and then it passed down from generation to generation in the Mughal dynasty. 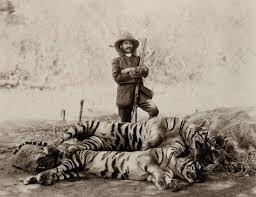 After the Mughals, the British mercilessly hunted tigers without regard to depleting their population. British influence also began to treat the tiger as vermin, promoting slaughtering of the cat because it posed a threat to livestock. From the 50 year period of British colonization as many as 80,000 tigers are thought to be hunted. The tiger was thus dwindling in numbers in the late 1960s, and only about 1,800 were thought to exist in the wild. However in 1969 Indira Ghandi helped form the tiger task force to help prevent against any poaching, then in 1973 she launched project tiger, which has now developed 48 tiger reserves across India. I took a safari in the Bandipur tiger reserve, and It proved to be a remarkably large reserve, full of tourists eager to spot a tiger in the wild. the reserve was monitored by guards and spans 874 square kilometers. this tiger reserve is split up into a core area, free from all human activity, as well as, a buffer zone that is on the outskirts of the core area. We toured around in the outside portion of the buffer zone, where safaris are aloud to venture. When I saw the tiger it was strangely comfortable with the humming sounds of our engine, and continued about its business, unfazed by human observation. Another crazy observation to me was that these vehicles were completely open with no protection. A tiger could easily attack us if wanted to, and none of our guides had guns to fend off the beasts. This lead me to the further observation that these tigers don’t pose as much of a threat as I speculated. This will make it easier for any poachers to go in the reserve and kill the tiger because of its numbness to human contact. Its more natural for the animal to hide whenever it heres foreign noises, such as a car engine, rather than to to just ignore it. Safari truck creeping behind the tiger. Although project tiger has been enacted tiger poaching is still rampant today. Between the years of 2014 and 2016, tiger poaching has made a 63 per cent increase throughout India. 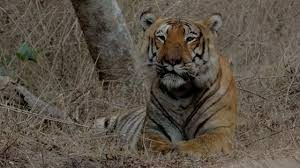 The National Tiger Conservation Authority believes much of this is due to the lack of information a majority of tiger reserves are not maintaining, such as, kill data, camera trap records, and an ID files of each individual tiger. The global worth of tigers today stand at about $37,000 for tigers skin and bones. The value of the tiger makes the risk well worth it for the poachers to continue hunting even if the threat of being locked up occurs. Countries such as China have strong traditional values in tiger parts being used for healing. These strong believes have caused the extinctions of tiger populations in China, and are starting to wear down on India’s populations. Roads that pass through Tiger reserves also pose a large risk to the tigers, as well. 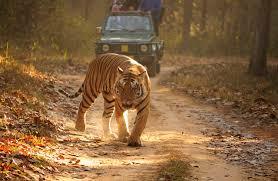 These roads create fragmentation which limits the tigers range of territory. These roads can cause tiger disputes from overlapping territories between two males, thus causing fights. These roads also pose the risk of tigers getting hit by cars. Project Tiger has come along way to isolate the tiger from human contact, however bustling roads still pass through these reserves. The tiger represents the national animal for India, and thus represents a historically significant species that use to abundantly roam India. This species has proven to be resilient throughout the history of poaching, but still continues to be challenged today. Conservation efforts are a start, such as project tiger, but even these efforts have a ways to go for the future. It would greatly sadden me to see this species perish and I hope India continues to strengthen its programs to stop the attack of black market poachers.